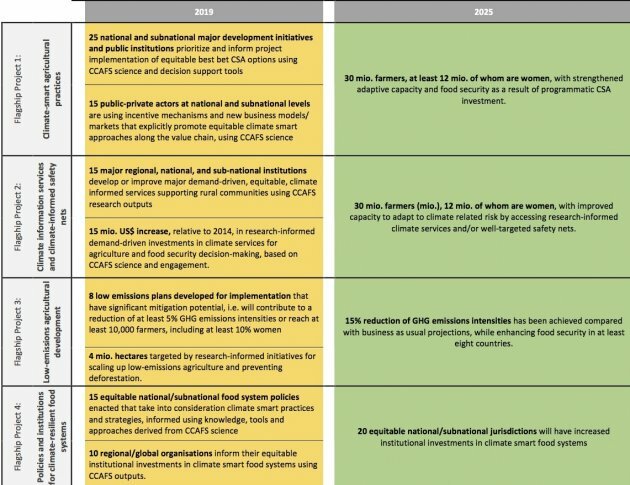 A results-based management approach guides the CGIAR Research Program on Climate Change, Agriculture and Food Security (CCAFS) overall research for development work. This approach means using an impact pathway (IP), built on a theory of change, emphasising and visualising the contribution of research outputs towards development outcomes, accompanied by a learning, monitoring and evaluation system. 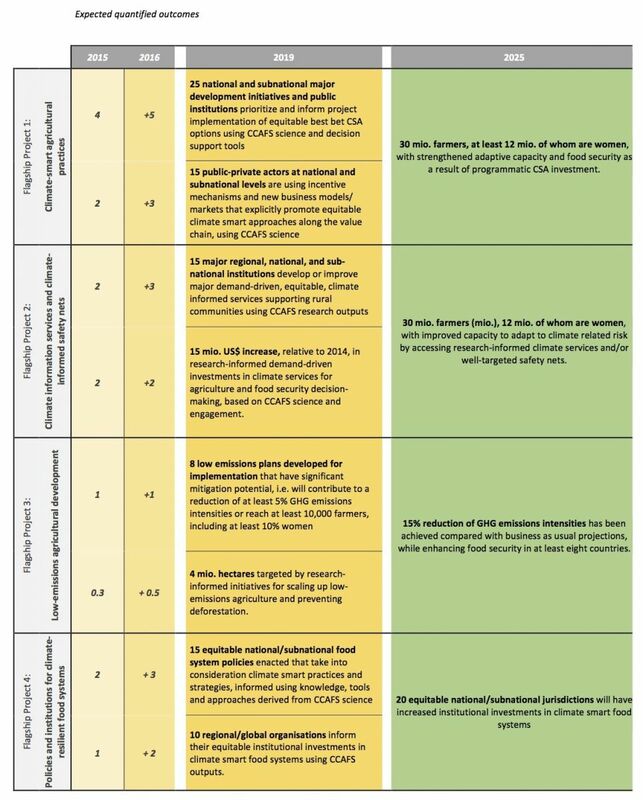 The impact pathways for each CCAFS Region and Flagship Program outline plausible pathways of how research outputs will contribute to development outcomes from local to global levels, as well as which partnerships are needed to deliver on set outcomes. Outcomes refer to changes in knowledge, attitudes, skills and most importantly practices in next-users, the people who directly use research results and products. These can include policy-makers, development organisations or international research institutions. Next-users have the ability to create an environment that ensures impact reach end-users such as smallholder farmers. Internal capacity building, to efficiently create and manage theories of change, impact pathways and monitoring and evaluation systems, has been built throughout CCAFS, through workshops, peer-assist, webinars and general guidance from the results-based management trial period in 2014. Every Flagship Program and Region has an impact pathway, showing how regional (and some global) projects are feeding into the Flagship’s outcome delivery. Thus, each regional impact pathway is nested within the Flagship impact pathway. In order to monitor progress and ensure CCAFS stays on track on its impact pathway, indicators and targets for 2019 and 2025 have been formulated. The program will monitor a total of 12 indicators, four outcome indicators for 2025, and eight for 2019. Progress towards these indicators is defined by the projects and monitored annually, quantitatively for the set outcome target numbers accompanied with a qualifying narrative, or “outcome story”.